Would you like to make your next vacation a true eco-friendly experience in first class accommodation, spa and wellness facilities? Consider Floating Leaf Eco-Retreat in Bali. Floating Leaf Eco Retreat's Wellness and Yoga Retreats at Sukawati, north of Sanur on the Bali South-East Coast, are unlike others in that they combine authentic Balinese culture, traditional healing, expert spa treatments, philanthropic opportunities and holistic wellness with your yoga instruction course. Come alone and make friends, with your own group, or join an upcoming retreat. Great care has been taken in the planning and construction of Floating Leaf to ensure that sustainable and eco-friendly products were used whenever possible. Their mission is to be an exemplary model for sustainable living without sacrificing luxury, style, function, design or technology. So be prepared to see plenty of bamboo and local timber all around you. Keep an eye out for several more exciting announcements yet to come. You don't need to have a group to enjoy Floating Leaf; individuals are welcome as well. Let the Team design your personal 'Ultimate Bali Experience'. Just visit the special packages page to check availability to experience Floating Leaf Eco-Retreat on your own or with a small group. TripAdvisor and Travelers around the world vote Floating Leaf Eco-Luxury Retreat as the Travellers' Choice 2015. Floating Leaf Eco-Luxury Retreat has won the Travellers's Choice Award 2015, and this sets them among the top 1% of hotels worldwide. A very gracious and kind article was recently published about Floating Leaf and we're blushing. We wanted to share it with you as so many of you are directly responsible for this esteemed honor. We congratulate all of you and our dedicated staff for helping make Floating Leaf Eco-Luxury Retreat one of the best hotels in Bali. 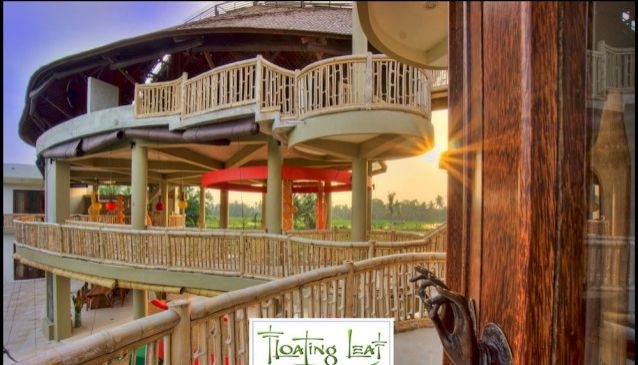 According to Trip Advisor, the travel industry's premier customer rating and review platform, Floating Leaf is considered among the Top 5 of over 1,000 Bali hotels, surpassing some luxury brands like the St. Regis, Hyatt, Oberoi and Four Seasons. We'd like to take this opportunity to personally deliver an enormous 'Thank you' to all our guests for your wonderful 5-star reviews. Without them we would not have achieved such prominence. Taking the time to write a public review of your stay with us is appreciated more than you could imagine. Some of you have even taken the time to describe, in great detail, your specific experiences. We are humbled by your kindness. Our goal at Floating Leaf is to exceed each guest's expectations by paying attention to specific individual needs. We work hard at ensuring that nothing is overlooked, and no one works harder than my business partners, Putu and Mikaku. A common remark in TripAdvisor is that guests feel like a part of the family when they come to Floating Leaf. They leave after making new, life-long friendships. Not only is Floating Leaf Eco-Luxury Retreat one of the top 5 hotels in Bali, but it continues to receive recognition for its nomination to the 2016 World Luxury Hotel Awards for 'outstanding service.' We're also among Trip Advisor's top 1% of hotels worldwide and the top-ranked eco-retreat in Bali.